There's something self-indulgent and luxurious about an all-you-can-eat buffet, but a natural-foods buffet on the other hand seems positively virtuous - "Eat what you want - it's all good for you." 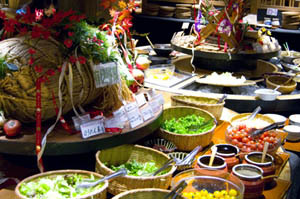 The real fun of a buffet, though, is being able to try lots of different flavors without having to decide what to order, and the spread here offers ample variety. It's mostly stuff that you'd find in a typical izakaya - more vegetable dishes and salad ingredients than average, but plenty of fish and meat as well. 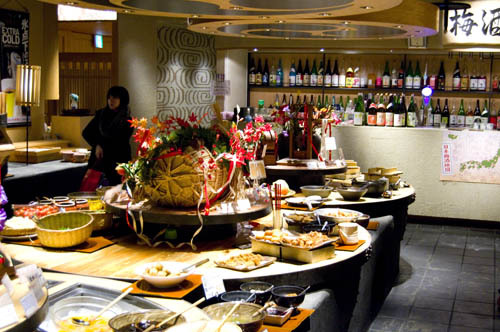 There's excellent fatty pork kakuni, fried chicken and oysters, saikyoyaki-style grilled salmon and lots more fish. There are stacked trays of steamed Chinese dumplings, udon noodles and rice dishes, and lots of desserts like soy-milk pudding and annin-dofu, plus a selection of ice cream. One particularly attractive feature here is the variety of open-bar options. 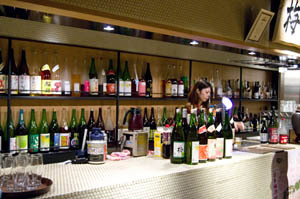 The cheapest plan (around Y800 extra on top of your meal) includes 100 different kinds of umeshu (plum wine). It's an excellent way to explore the world of umeshu, not just shochu-based but also made from sake and brandy. Other drinks plans offer beer, wine and cocktails. The basic buffet is Y2800 at dinnertime, and Y1600 at lunch, with cheaper prices for kids. They seem to offer a lot of limited-time special deals also, so it's worth inquiring about them. Taito-ku, Ueno 1-20-11, Suzunoya Bldg 4F.